The icon for the Shotgun in GTA 2. The Shotgun is a firearm first introduced in Grand Theft Auto 2, known for its ability to inflict maximum damage in closed quarters. Since its adoption, the shotgun has appeared in some form in all Grand Theft Auto games, mostly appearing as a weapon tier in later games. In a nutshell, a shotgun is typically a powerful firearm which effectiveness diminishes in distance (as the bullets disperse into a wider area), and thus is more suitable when shooting targets in point blank range. In GTA 2, the game makes its very clear that the gun shoots three pellets at once. This may allow the player to hit up to three targets at once if they aim at a large group of people. In addition, players in GTA 2 are allowed to fire the gun while running, an ability that was stifled after GTA 2. Shotguns tend to impose one-hit kills, and is equally devastating when aimed at a vehicle, which will explode from two or three gunshots from a shotgun. The library of shotguns were increase from GTA Vice City onwards, typically allowing the player to choose one of two or three available shotguns in the game; as a result, the "shotgun" name is also used to refer to a weapon tier in these games. Shotguns from GTA III onwards were also modified to limit mobility while wielded - the player character is not capable of sprinting and, in some games, is required to stand still when targeting; one exception is the Sawn-off Shotgun, which doesn't just allow the player to fire while running, but also wield two Sawn-off Shotguns at once. Prior to Grand Theft Auto: San Andreas, a close range shotgun blast can knock the player down, making them defenseless, even with body armor. However, in GTA San Andreas, and games from Grand Theft Auto IV onwards, this weakness was eliminated but the player may still suffer tremendous damage at close range. From GTA III onwards, the player may receive 5 shotgun shells by entering a police car, and a shotgun will be added to the player's weapon slot, if the player doesn't already have one. 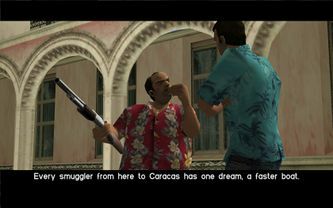 Shotguns in GTA 2, GTA III and GTA Advance are typically unnamed, although for the latter two, they are evidently based on a real life rendition (whereas the GTA 2 rendition is of an original design). This page was last modified on 3 October 2012, at 11:11.